Anyone have any ideas on how to troubleshoot? 1) Use the options that we have specified in the User Guide. I had tested those, to make sure, that ssh works. 2) You could run the qemu cmd from cmdline, with the options that you have (remove the -nographic option). On tty/console. you should be able to see errors, if any. Would be interested in knowing what you see by trying these. Thanks for the reply. I did just what you suggested in (2) above, got a console, and watched the boot. Only error I saw was a non-fatal failure of the "Installing default acl boot rules..." where it threw an error on line 29 that /usr/cumulus/bin/cl-acltool could not be found (bet you already are aware of this error though.) The boot process completed successfully, and I did get a login prompt on the console. debug1: Connecting to localhost [::1] port 1401.
debug1: Connecting to localhost [127.0.0.1] port 1401. Again, how does the connection to TCP/1401 get me into the VM?? Can anyone from the Cumulus staff please answer me question above? Would love to get this working! 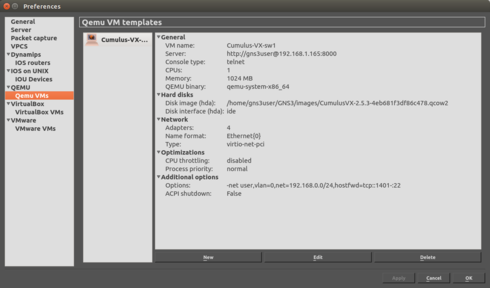 What setup did you use in setting up Cumulus VX in GNS3? I would like to dig in more and help you out. Let me take a look on my side and we can get deeper. How do you mean “what setup”? 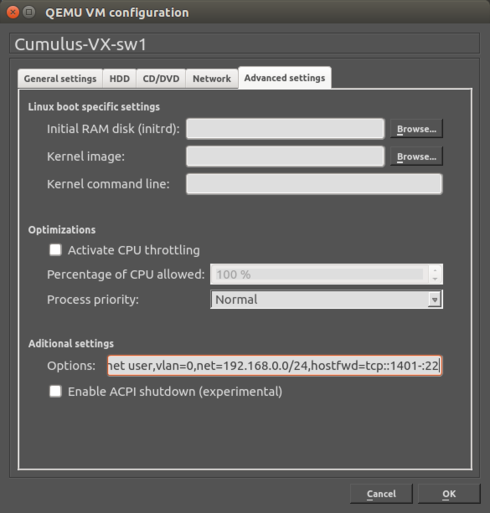 How the settings are in the GNS3 GUI for the QEMU VM? I followed the guide at: http://docs.cumulusnetworks.com/display/VX/Using+GNS3+with+QEMU+and+KVM+Virtual+Machines for the basic setup; the one thing I found is that for me at least, I could not use the older “virtio” driver, but had to use the newer “virtio-net-pci” driver for the NICs. I am comparing your configuration to the demo configuration provided in the VX guide. Is there a reason you chose to setup the qemu line as you did? It looks like it is not parsing the port rules correctly and therefore 22 is not getting opened properly. If you have reason for setting your environment up as such please let me know and we can work on it a bit more to figure out the issue. I found that if I switched the Type dropbox to be "Paravirtualized Network I/O" (QEMU NIC driver 'virtio-net-pci') then the VM starts fine. Will, I have asked the engineer who put that section together too take a look. Please bear with us as we dig deeper into this. Great, thanks Scott! Let me know if you need any other info. In the QEMU VM configuration dialog, click the Network tab. Increase the number of Adapters to 4. Select the Checkbox, which states "Use the legacy networking mode". Select the Type (from the drop down list) to be "Legacy Paravirtualized Network I/O". I believe that the first time I tried your published config, that I did not check the "Use the legacy networking mode" checkbox (which is NOT specified in the doc), but did set the "Type:" field to "Legacy paravirtualized Network I/O" (which IS specified...) and hence got the " 'virtio' is not a valid device model name " error... I now see that checking that checkbox makes for a "-net ..." line instead of a "-device ..." line for each NIC. I am not that well-versed with QEMU networking; can you (briefly) explain what the difference is between using "Legacy" or not using it? In any case, it is now working for me, and I thank all you Cumulus folk who assisted me in resolving this. Of course, someone should update the doc as to the need to check the checkbox for "Use the legacy networking mode"
Ouch, sorry for the oversight in the docs, Will. I've updated the doc to reflect this.